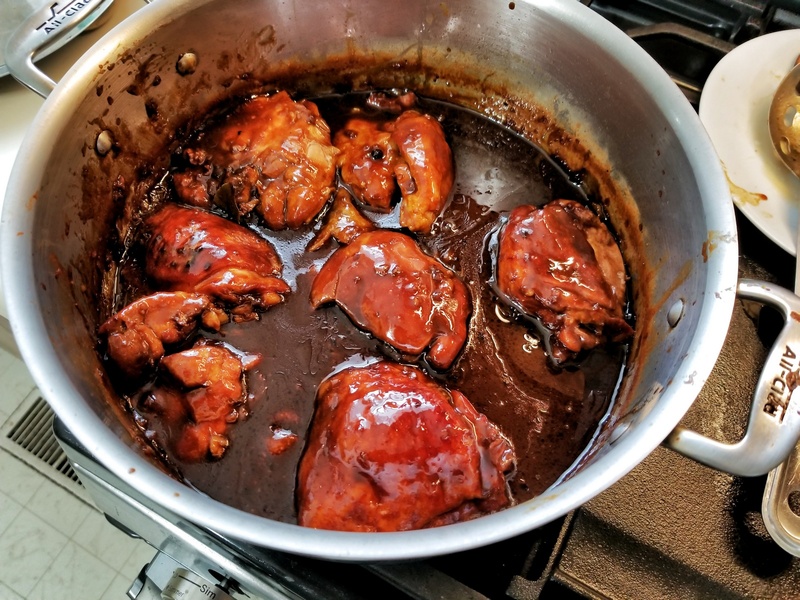 I used the NY Times adobo recipe because it called for coconut milk – I’ve had a can languishing in my cupboard for too long. Most recipes I skimmed over just went with what appears to be the consensus recipe ingredients of chicken, garlic, vinegar, soy sauce, bay leaves, and black pepper. After spending a few hours in the fridge marinating, I dumped the mixture out into a big pot and brought it to a boil. 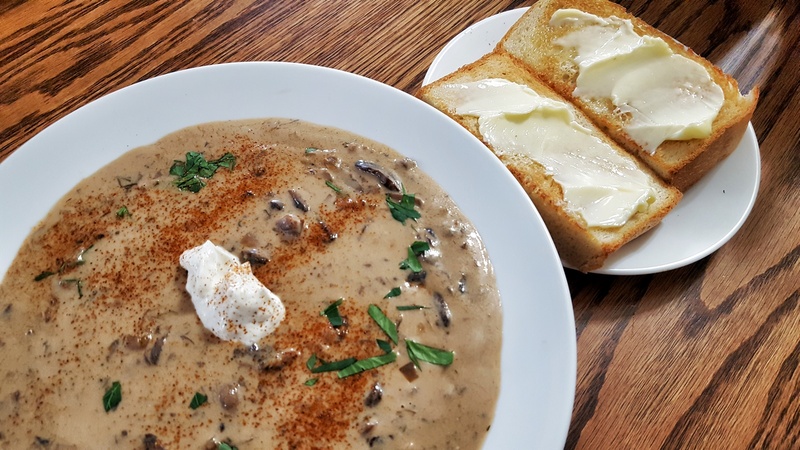 I’m using some dark soy in my take on the recipe, I have mushroom soy plus a glug or two of sweet soy with the regular light soy, rice vinegar, coconut milk, 12 cloves of pressed garlic, bay leaves and ground pepper. I tossed in some whole peppercorns as well. Reduce to a simmer, cover, and give it a hour. 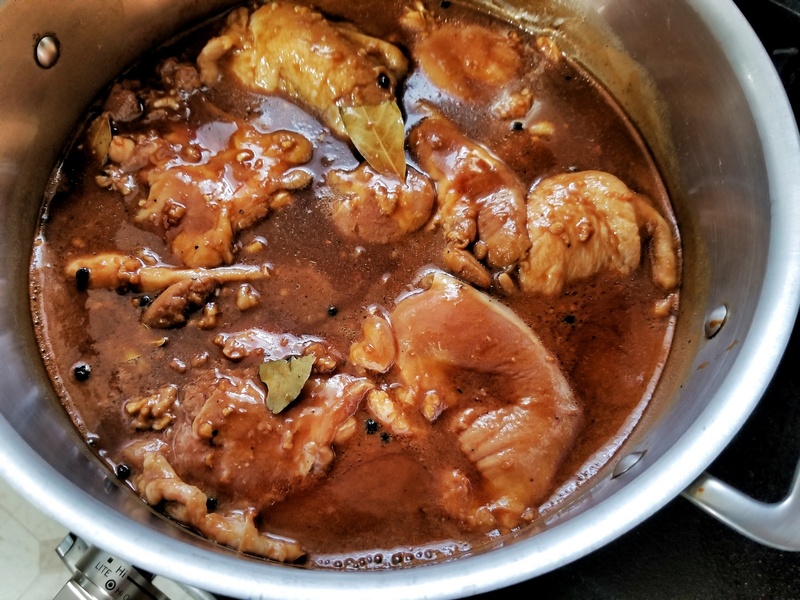 Remove the chicken pieces to a bowl, increase the heat to reduce the sauce. I went ahead and put these thighs under the broiler to get some crust on them while I waited. Return the chicken to the reduction to keep them warm while the rice cooks. I went ahead and steamed some broccoli to give my presentation color. This dish is delicious. I had some earlier in the week sans the coconut milk in the sauce, and turned it into a stir fry. It’s been much too hot to cook over the last two weeks and with the fairly consistent afternoon showers, grilling is out. So I pulled out the slow-cooker and have been making some nice main courses. I had a craving for a roasted chicken (can you imagine?! It’s 101 degrees out and I want to roast something! 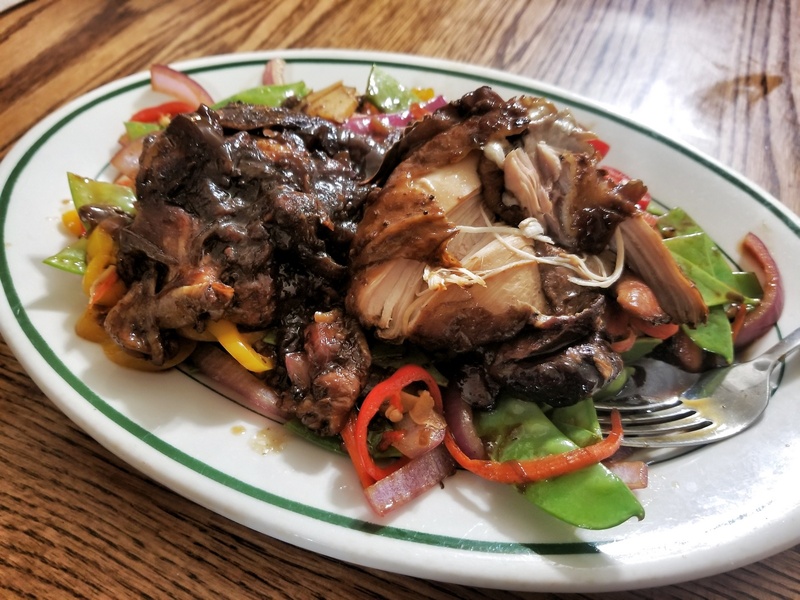 ), so I put thighs (bone-in, skin on) in the slow-cooker, on high, with some seasoning and in 4 hours had nicely ‘roasted’ chicken. Served with a fresh salad and tomato slices. After that, I decided that a slow-cooker meal would be a nice idea for this week’s dinner menu. This one is full of exotic flavors and fresh vegetables. I put green beans on the menu, but whatever catches your eye in the garden or farm stand would do just as well. And if you have peaches available, use them instead of tropical fruit cocktail. Night before, rub salt and sugar on pork ribs and refrigerate overnight. In the morning, put ½ cup water in slow-cooker along with ribs. Mix together remaining ingredients and pour onto ribs. Cook according to manufacturer’s directions (usually 8-10 hours on low) until meat is tender and pulls from the bone. 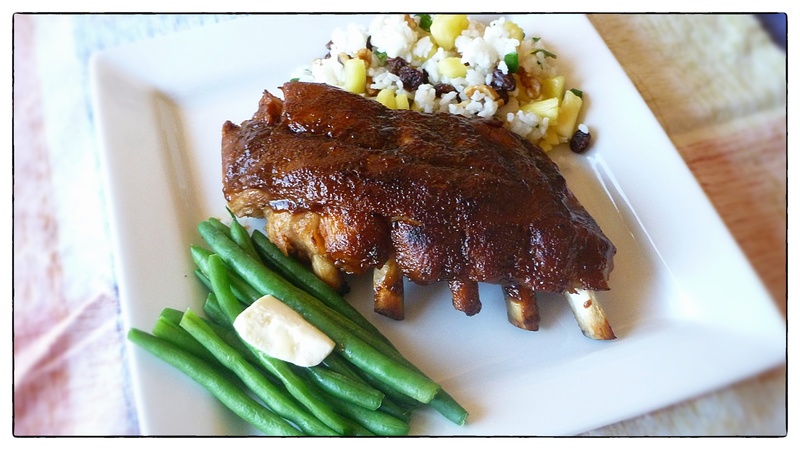 Note: Depending on your slow-cooker size, you may have to cut the ribs into sections that fit. Add rice and liquid to saucepan, bring to a boil, cover, reduce heat and simmer until all water is absorbed. Heat butter in large skillet over medium-high heat. Add onions, walnuts, raisins, salt & ginger; cook and stir 2 to 4 minutes or until onions are tender. Add rice and pineapple; stir and heat thoroughly. Fluff with a fork before serving. Tropical Fruit w/coconut and ginger ale – drain fruit then toss with ginger ale and coconut. Let’s start with a few housekeeping tasks: First, stay safe today if you’re in the snow path (SNOWMYGAWD!) and second, the latest Katie-on-the-run update is here. In the shadow of the Rockies we are expecting about 4 inches of the white suff Saturday. So Valentine’s Day. I’m not a fan. I’m not anti-Valentine’s Day anymore than I’m anti-New Year’s Eve. But I am of the opinion that going out to a restaurant on Valentine’s day is a recipe for disaster: so-so food and rushed service, even at the best restaurants. Instead, I like to cook – ok, I guess that’s nothing new. One of my favorite menus for the big day is here. This year I was looking for something new. 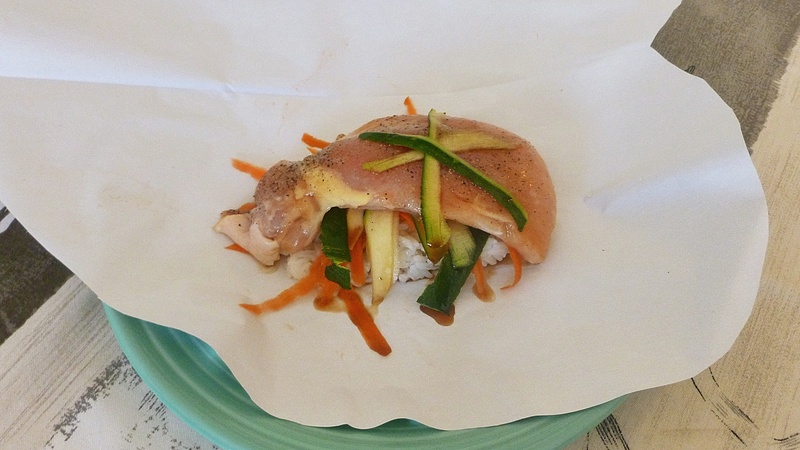 I’d been thinking for a while about testing out a recipe “en papillote”, quite literally, in parchment. I thought this would make for a special dinner. 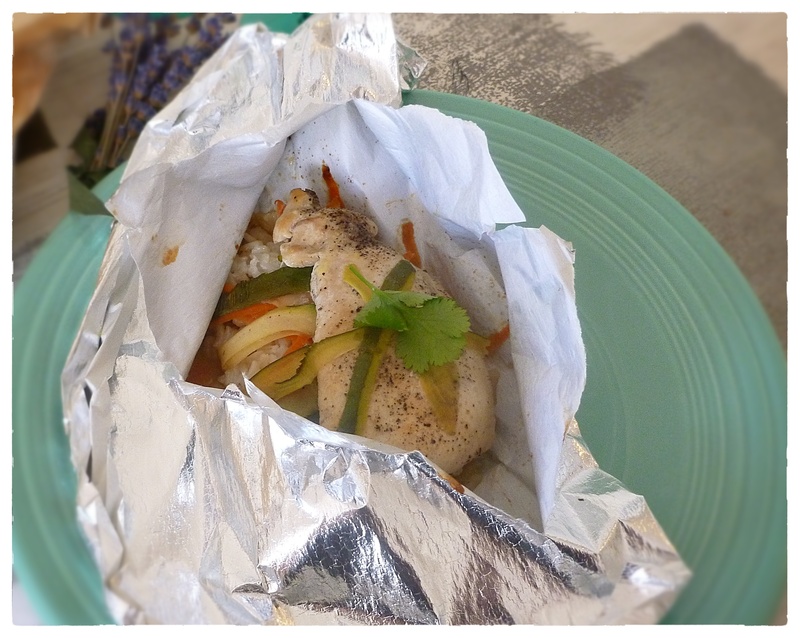 I tested out two types of parchment – the first was a parchment bag and the second was parchment lined foil. Below you’ll find detailed instructions and a couple of simple recipes. But first, what are your plans for Valentine’s? Do you go out, do you cook and most importantly, is there chocolate? In any of these recipes you can use plain parchment, as well. 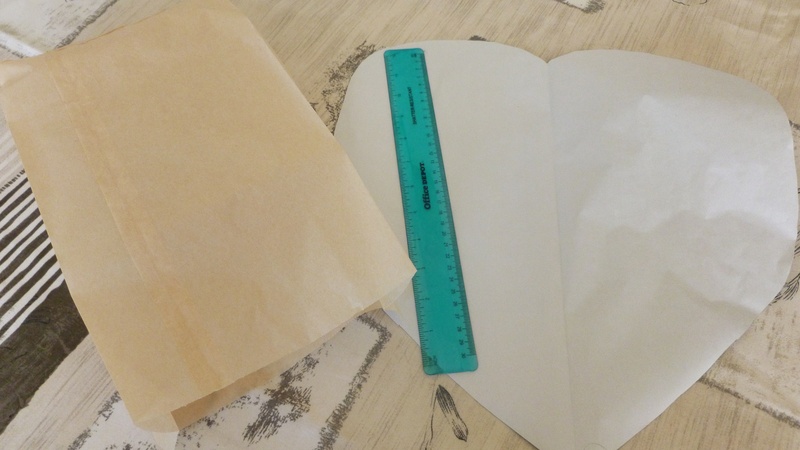 With the parchment paper – plain or foil lined, you start by cutting it into a heart shape. I cut it at 16″ long, but it probably would have been ok at 12 inches. I focused on chicken, but the technique is often used for fish. Kirk Spencer has a lovely stuffed fish recipe here. You can adapt any of these recipes to fish or chicken. The key is to make sure you have enough liquid and you make a tight seal in order to poach/steam the ingredients. The recipes were pretty simple. 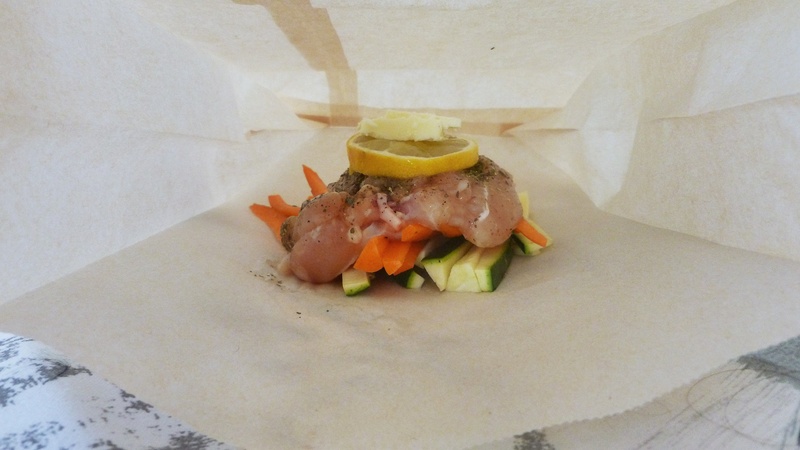 In the parchment bag, I placed carrot and zucchini sticks, a chicken breast and drizzled with lemon butter, garlic, rosemary and sage. I added a bit of butter and lemon slices on top. 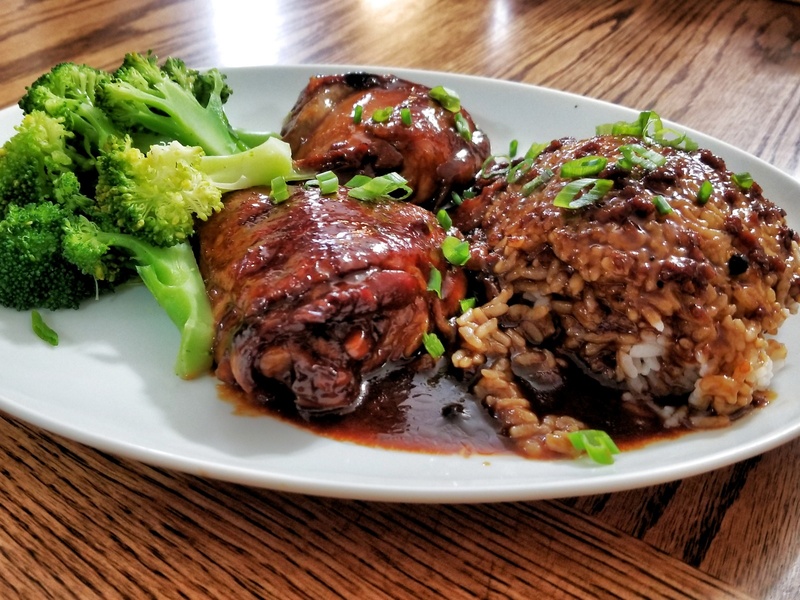 On the parchment I put cooked rice, vegetable curls (using the vegetable peeler), chicken breast and drizzled with soy sauce and rice vinegar. Then fold up the edges and seal tightly. 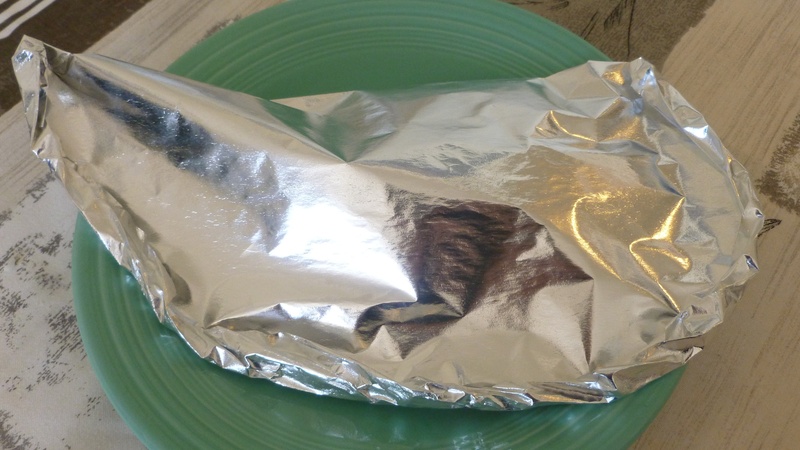 I really like the foil for this, it was easy to roll up and seal. While you’re putting everything together, preheat the oven to 400 degrees and heat a baking sheet. Place the sealed packets on the heated baking sheet. Bake for about 15-18 minutes, until chicken is cooked through. You can serve it on the plates in the packets or plate it up. I like having the packets. 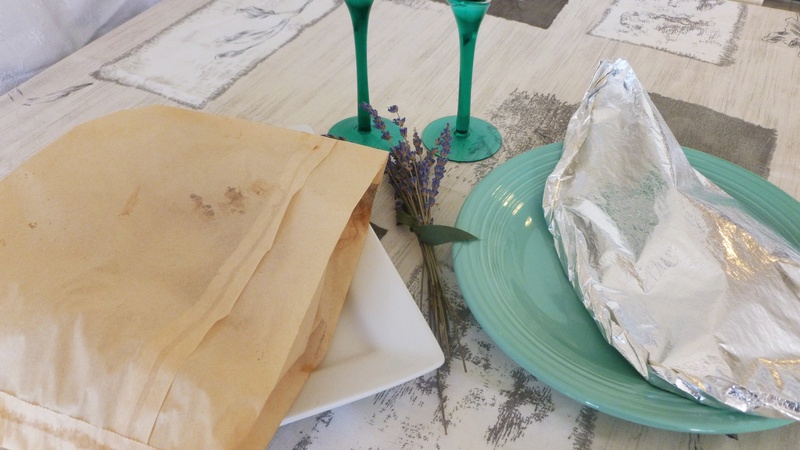 All in all, I think I preferred the parchment with the foil back. 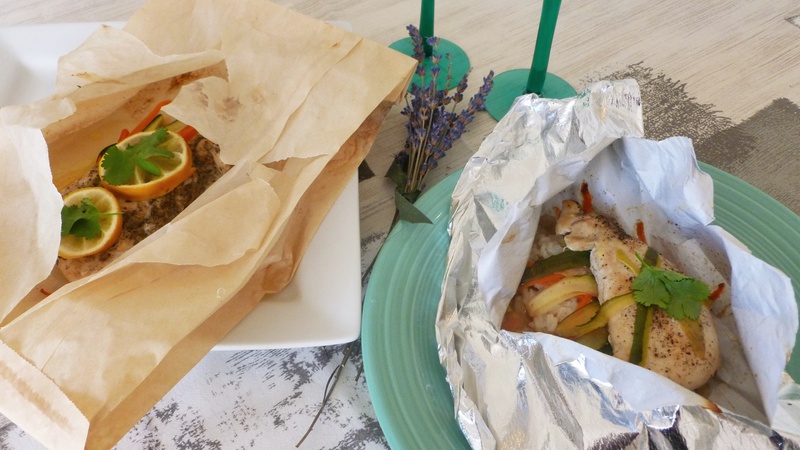 It was as easy to deal with as the parchment bag, a bit easier to arrange the ingredients, it sealed better and I think the presentation is prettier. The best part of this cooking method is that it was easy, quick, no clean-up and made a fun plate. Leaves plenty of time to make the fancy chocolate dessert. Have a happy Valentine’s Day! I had a request to do some grilling and picnic recipes for the next few weeks (thanks Yutsano). We’ll traverse the table: meats, vegetables, side dishes and desserts. By July 4th we should be covered. Tonight we’ll start with grilling chicken. I have a stockpile of marinade and grilling recipes for chicken breasts. 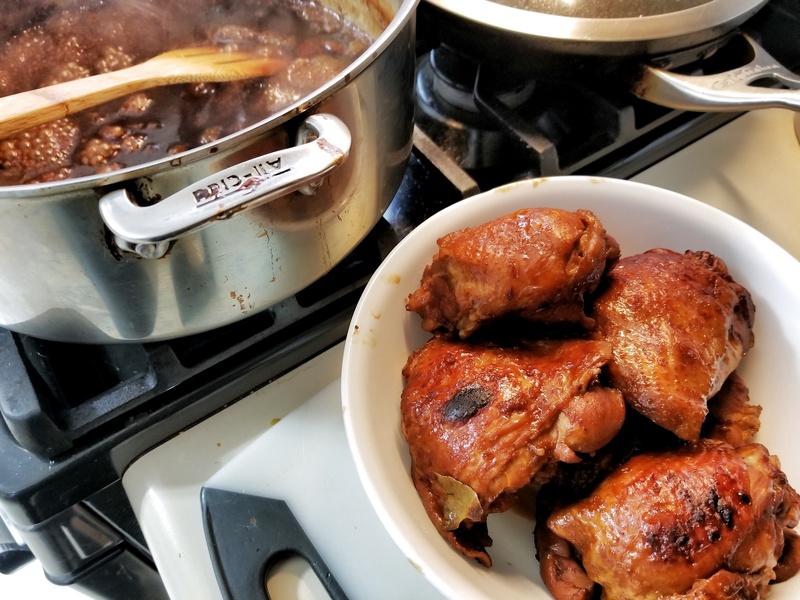 I may be in the minority, but when it comes to many chicken dishes, including bbq and fried chicken, I prefer thighs. They have more flavor and are moister. The introduction of boneless thighs was like a culinary miracle as far as I was concerned. When I am using marinades, though, I actually prefer boneless breasts. Similar to pork loin, they take on whatever flavors are introduced and cook up quickly. 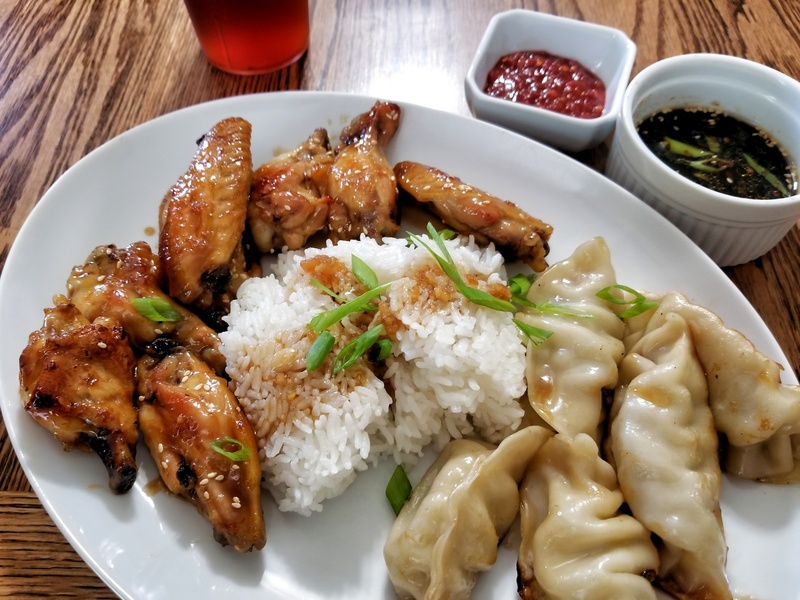 When using a marinade, I think their blandness proves more of an asset than a deficit; they are kind of like a blank canvas for introducing flavors. Cranberry Grilled Chicken (recipe here) is one of my favorites and anyone who has read this blog, knows I LOVE cranberries. And Sunrise Chicken (recipe here) is a great citrus based marinade. Tonight’s feature recipe is a marinade that is meant for grilling. Grilling gives the marinated breasts a nice crust. It can also be used on pork loin or boneless pork chops, though I prefer apple cider or cranberry juice to the grape juice in that case. So what do you look forward to the most at a picnic? What’s your favorite thing to grill? 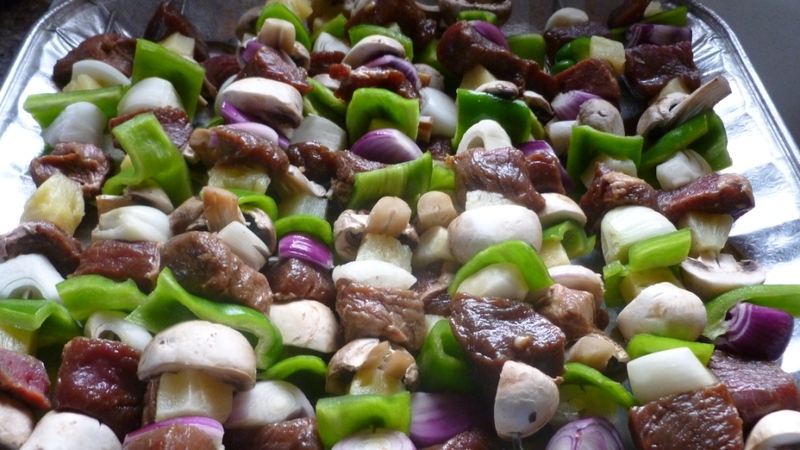 Add all ingredients into zip lock bag and thoroughly coat & let marinate overnight. Grill 15 minutes each side, 165 degrees internal temp. 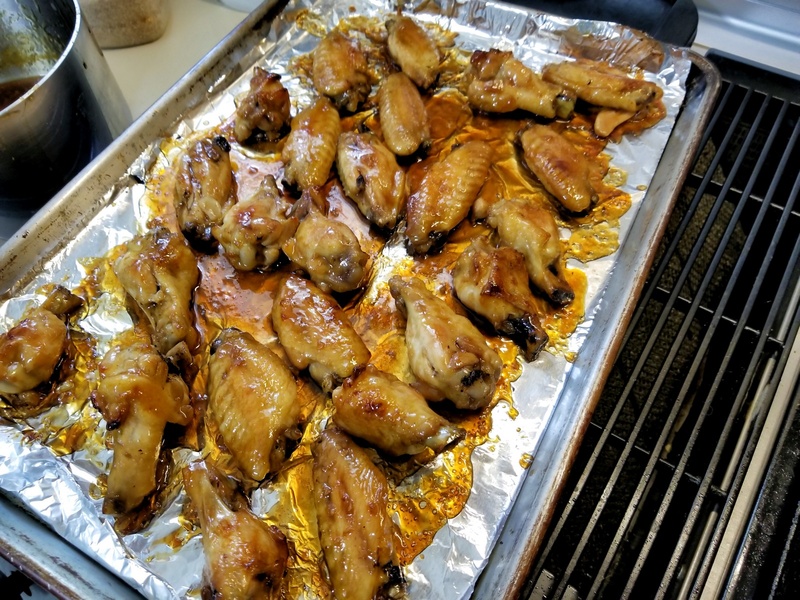 When grilling, to avoid drying chicken out, sear on each side (about 5 minutes each side), cook 5 additional minutes for each side, baste with marinade if desired, then move away from high heat for rest of the cooking time. The thickness of the chicken breasts makes a difference here, so adjust accordingly. You’ re on your own tonight. I’ve been asked to film a drumming on Sunday and tonight is going to be a trial run. Should be fun.